REGISTER as an Individual: use this option to direct all donations to a single page, regardless of whether you are an individual or a company. This also offers the opportunity to brand the page with a logo and you will receive a unique URL to send out to anyone you’d like to encourage donations from. FORM A TEAM: This option is ideal in a business setting where different departments/branches/etc. compete to see who will raise the most funds. Each department has a designated team captain who sets up the team and invites team members to Join a Team. Once a team is created, the captain can invite individual team members to join who will receive their own fundraising pages, and can further recruit others to help raise funds. JOIN A TEAM: use this option if your company/organization has already set up a Virtual Food Drive and you’d like to join your team. This gives you the ability to receive your own fundraising page, which you can use to further recruit others to help raise funds. DONATE: Go directly to the Virtual Food Drive store and shop for our most needed food items. Here you can also Donate Without Shopping. If you’d like to kick start your Virtual Food Drive with a donation, don’t forget this step. This is also where you set a goal for your Virtual Food Drive, which will be shown on your fundraising page to track your success. Follow the steps to complete your registration page, review the information and hit “Complete Registration.” If you chose to include a donation during this process, you will be directed to a Payment Form. Once you have completed these steps, you will receive an email confirmation with a link to manage your Virtual Food Drive by logging into your Participant Center using the same user name and password information provided when setting up your Virtual Food Drive. Email: Let your supporters know about your drive. Send out emails (we’ve even included samples to get you started) to ask for donations and to thank your supporters. Don’t forget to read through the email template and fill in all customizable areas with your specific information before sending. Tracking: Stay in the know by tracking the progress of your drive. You can view donation history and enter offline gifts (checks & cash). Personal Page: Make it your own! Add a logo or image and change the heading of your page if you’d like. We suggest leaving a short personal message in the body of your page. No time? You can use the Utah Food Bank information and video already on your page. 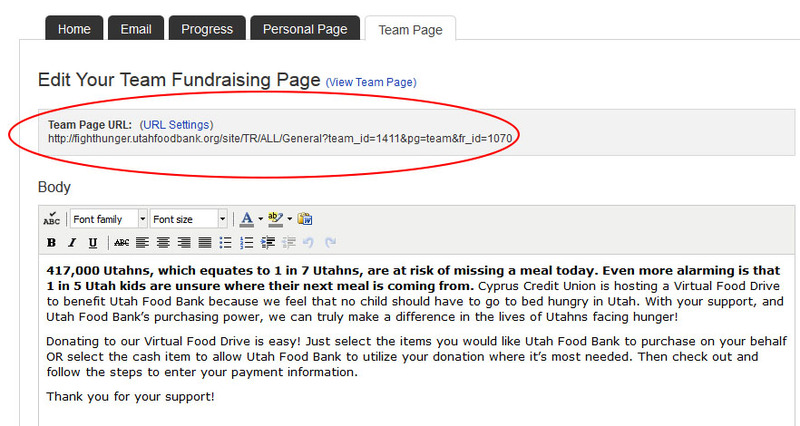 Create a shortcut for your fundraising page: Make it easier to share the link to your virtual food drive page by shortening the link. Go to http://bitly.com/ and set it up for free. We highly recommend this if you plan to post your Virtual Food Drive on social media.